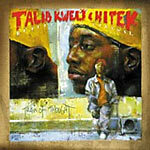 Straight off-the-hook classic memorable hiphop material by Talib Kweli & Hi-Tek as Reflection Eternal. You've probably already heard it about a million times so I'll just shut up now. I became a huge fan of Kweli after purchasing his collaboration with Mos Def, "Black Star". Kweli's impenetrable flow held my attention to it's fullest. After hearing "DEFinition", I knew I had been missing out on some true talent over the years. Without hesitation, I immediately snatched up this critically hyped record. With dangerously high expectations, I threw it in for my first listen, and I was simply blown away once again. Talib is quite the poetic emcee. While emcees and producers from labels such as Definitive Jux and Anticon are reprogramming the commercially suffocated genre, Talib is rejuvenating it with the basic raw elements, which is truly a breath of fresh air. As interested as I am in hearing a transformation of hip-hop, it's just as interesting to hear an expansion of the classic elements. And nobody does it better than Talib Kweli and Hi Tek. Hi Tek has come a long way from the minimalist beats brought forth on the "Black Star" album. The beats definitely have a flair and style that are rightfully desired for a follow-up. And Hi-Tek proves to be a lyricist with this lyric on "The Blast" - "Going for the gusto, keep getting that provo / It's Hi-Tek (and Kweli) on the track like Flo Jo / Bet you ain't even know I had flow though". It's an exciting listen from the intro to the hidden gem at the end, "For Women". "Move Somethin'" and "Some Kind of Wonderful" are truly impressive standouts that will hook you for the full 70-minute ride. The latter features some of my favorite lyrics - "What's next? / These chicken neck MCs get me vexed / My rhymes be blowin' up chat rooms all over the internet". Other highlights include "Good Mourning" and "Too Late". All in all, "Reflection Eternal" is hip-hop at it's finest. If skills actually sold the music, Talib Kweli would be one of the most successful commercial artists in hip-hop. But since Clear Channel runs the industry, I guess he'll have to settle for being one of the most critically acclaimed emcee's in hip-hop. Not that I'm complaining. Anybody who knows good hip-hop, knows that all the good stuff is underground. The prolific MC is definitely one of my new favorites. And you can bet I'll be checking out "Quality" (2002) and "The Beautiful Struggle" (2004) after hearing this fine masterpiece.